New research finds that women who start their pregnancy with higher levels of belly fat were more likely to develop gestational diabetes. Here's how to minimize it. Starting off your pregnancy with belly fat could indicate you're at higher risk of developing diabetes later in pregnancy, according to a new study published in the journal, Diabetes Care. Researchers at St. Michael's Hospital at the University of Toronto looked at 485 women and measured their subcutaneous fat (found directly under the skin), visceral fat (fat that that resides around your organs, usually located in the belly), as well as how close the fat was to the skin's surface using ultrasound technology at 11 to 14 weeks' gestation. We discovered that women with higher levels of abdominal fat may be at risk of developing gestational diabetes at about 24 to 28 weeks of their pregnancy, says Leanne De Souza, a Ph.D. candidate in obstetrics and gynecology at St. Michael's Hospital and lead author of the study. "While I'm not a dietitian, following a low-fat and low-sugar diet combined with aerobic exercise in compliance with Canadian [or American] pregnancy recommendations would benefit women in controlling weight gain and minimizing excess abdominal weight gain," De Souza says. Strength training would also be beneficial but should be done with caution and your physician's recommendation, she says. "This study makes a lot of sense since visceral fat dramatically increases diabetes risk," says Erin Palinski-Wade, R.D., C.D.E., author of Belly Fat Diet For Dummies. "Although weight loss should never be encouraged during pregnancy, improving the quality of your diet can help to ensure excess visceral fat isn't gained and perhaps encourage your body to use visceral fat as fuel first before turning toward other stored energy sources," she says. Here are Palinski-Wade's tips for how to eat healthfully during pregnancy while minimizing ab fat. Ditch "inflammatory foods." These include simple sugars and refined carbohydrates and can elevate the insulin response and increase visceral fat. Simple sugars and refined carbs (think white bread products) are high in calories and usually low in nutrients. Steer clear of these throughout pregnancy and instead fill up on whole fruits, vegetables, and whole grains. If morning sickness has you reaching for bland, white-flour foods, opt instead for rye toast, 100% whole grain crackers, soup made with barley or brown rice, or whole grain pasta. Avoid sugary drinks and choose water, low fat milk, or 100% fruit juice. Bump up your omega-3 intake. Increase your dietary intake of omega-3 fatty acids which may not only help to decrease inflammation and belly fat, but can also boost the brain development of your baby. Great sources include fatty fish (limit to two to three 3-ounce servings per week) and plant-based sources such as walnuts, flax seeds, and chia seeds. Incorporate plant-based fats into your diet. Foods such as almonds, olive oil, and avocado are great sources of monounsaturated fats which have been found to help fight against inflammation and visceral fat. 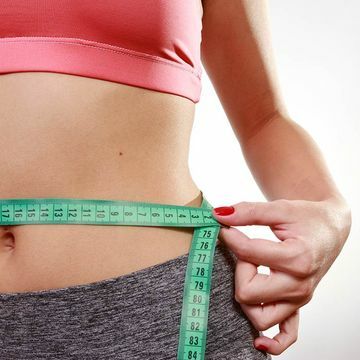 Prevent excessive weight gain. Although pregnancy is a time of growth and weight gain, gaining too much weight can be harmful to both your health and the health of your baby. In your first trimester, your energy needs remain unchanged. In your second and third trimester, you need an additional 300 calories per day. An ounce of nuts and one piece of whole fruit can provide you with almost all of your additional calorie needs. Focus on eating whole, unprocessed foods as much as possible to prevent against excessive visceral fat and excess weight gain while giving you and your baby the nutrients you both need. This combination of smoothie ingredients is packed full of antioxidants, omega-3 fatty acids, calcium, and lean protein to boost both mom and baby's health, Palinski-Wade says. Blend together and serve chilled.